Mr. David “Jude” Sexton, age 84, of Grayson, Kentucky, passed away Thursday evening, March 14, 2019, at Community Hospice Care Center in Ashland, Kentucky. He was born December 25, 1934, in Carter County, Kentucky, a son of the late Dennis and Opal Hardy Sexton. Jude was of the Church of Christ faith and was a Co-Owner and Operator of Willard Milling Company. 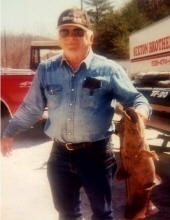 He enjoyed trapshooting, fishing, hunting, being outdoors and spending time with his family and friends. In addition to his parents, he was preceded in death by one son, Randy Sexton; two brothers, Floyd Sexton and Okie Sexton; and two sisters, Donna Sexton and Helen Gallion. Jude is survived by his wife of 65 years, Linda Sexton; two daughters, Vickie and Greg Howard and Angelia Sexton, all of Grayson, Kentucky; two grandchildren, Chris Sexton and Trent Boggs, both of Grayson, Kentucky; three great grandchildren, Eden Sexton, Chasity Church, and Isabel Boggs, all of Grayson, Kentucky; two great-great grandchildren, Alyssa Suttles and Kyler Suttles, both of Grayson, Kentucky; two brothers, Mitch and Nadine Sexton, Freeman and Sally Sexton, all of Grayson, Kentucky; and one sister, Deloris Jackson of Grayson, Kentucky. He also leaves behind many other family members and friends who will sadly miss him. Funeral services will be held at 1 p.m. Tuesday, March 19, 2019, at Grayson Funeral Home & Cremation Services in Grayson, Kentucky, with his son-in-law, Greg Howard officiating. Burial will follow in the Sexton Cemetery in Grayson, Kentucky. Friends may visit from 11 a.m. to 1 p.m. Tuesday, March 19, 2019, at Grayson Funeral Home & Cremation Services, 49 McCoy Road, Grayson, Kentucky 41143. To send flowers or a remembrance gift to the family of David "Jude" Sexton, please visit our Tribute Store. "Email Address" would like to share the life celebration of David "Jude" Sexton. Click on the "link" to go to share a favorite memory or leave a condolence message for the family.